Well it’s been a while since I posted because I’ve been super busy…but I have exciting news of two upcoming exhibitions. The first is a solo exhibition ‘Ebb and Flow’ in the Oak Tree Gallery, Helensburgh and the second is the Helensburgh Art Club‘s ‘One day sale’. My solo exhibition, ‘Ebb and Flow’ runs from Friday 11th May until Saturday 9th June in the Oak Tree Gallery, Helensburgh. There will be a range of work on show from seascapes to figurative work to flowers. 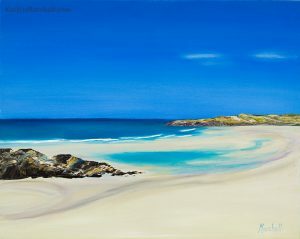 One painting on show is ‘Arisaig‘. It is a memory of family holidays when my children were toddlers. A local farmer allowed us to camp on his land, with access directly onto the remote sandy beach with turquoise waters. The weather was often changeable and the islands all but disappeared from view just as in this painting. I will be selling originals and prints, so hopefully there is something to suit everyone. The opening night is Friday 11th May from 7-9pm. I hope you can join me for some prosecco, art and banter. I will also have two pieces in the Helensburgh Art Club’s ‘One Day Sale’ on the 19th of May from 10am til 4pm. I’ll be showing ‘Contemplation‘ and ‘Can-Can Dancer‘. I’ll be popping in for a while so might catch you there!